The quality of Captain Black Pipe Tobacco can be found in its rich specially cured Cavendish tobaccos that blends with burley tobaccos for smooth Virginian sweetened taste and exceptional flavors. This ‘drug store tobacco’ as popularly referred to by the veteran Captain Black smoking community gives you an exceptional pleasant taste of high-quality smoke backed by over 30 years of fantastic products for smokers. Why is Captain Black Special? The specially blended aromatic tobacco is made with top flavor to give each tobaccos smoker distinctive taste of excellence. The smoke is a Lane Limited product that originates from the tobacco-loving people in America. 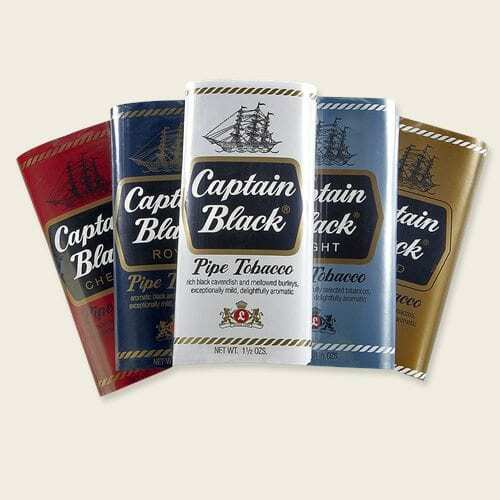 As an American company, Captain Black uses high-quality tobaccos imbued with consistent flavor. If you don’t like being left without a choice in the things you do, including your option of the smoke you take, you are indeed one of the best smokers around. In the social world, which tobacco smoking ably represents, what makes life sweeter are the choices you have. With Captain Black, your options are many with uncompromising qualities in every brand of Captain Black Pipe Tobacco you choose. Why should you go for Captain Black Pipe Tobacco? If you have been following development in the smoking world, you will find that smoke reviewers have hardly had anything wrong to say about Captain Black Pipe Tobacco. 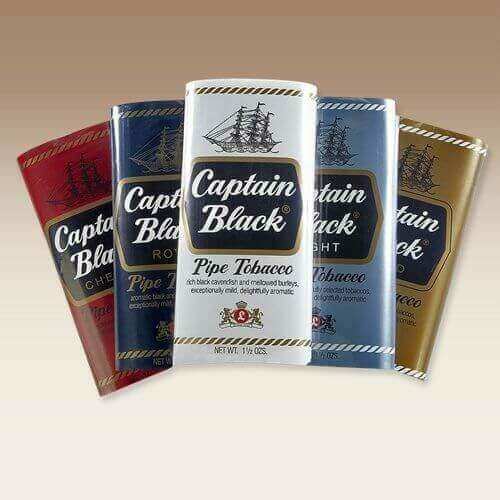 Unlike the criticisms received by most ‘drug store’ tobaccos, you will not find such bad mouthing of captain black because of the many years of consistent quality product delivery that satisfies many tobacco smokers including the pundits! One thing most people find so inviting about captain black is its pouch aroma; this comfort bringer reminds you of your childhood memories for savoring the aromatic smell of your grandpa pipe coming from the courtyard. This is similar to the rare delight of apple pie oven aroma that keeps you salivating for a piece of the pie when it’s ready. Such is the thought-provoking experience you get from the magical scent of captain black pipe tobacco that adds excellent values to a smoking pipe. What happens when you lit captain black pipe tobacco? If you are a regular smoker of other aromatic tobacco, you will expect to relight your pipe several times in the course of smoking, but you will not have to do that when smoking captain black. Yes, you heard correctly, captain black stays lit for a longer time. It does not matter if you are a slow smoker or not, your smoke will smolder on and wakes when you draw the pipe anytime. That means you could smoke the tobacco up to an hour, carefully savoring the sweet aroma to the pleasure and good feeling of people around, including non-smokers! What is a captain black pipe tobacco smoking taste like? The flavor and the pouch aroma of captain black are comparable to none in the tobacco smoking world. The sweet, mellow vanilla flavor resembles that of roasted marshmallow tasting like whipped cream which makes a great combination with a glass of Van Gogh Espresso. Whatever version of captain black you smoke, whether it’s Gold, Black, Royal, Cherry, Dark, or light, you are getting real value for money. The irony of it is that each pack of either 12oz or 1.5oz is quite affordable and satisfying. Imagine having to sip the flavor of captain black to avoid biting your tongue, yes that is how tempting and great the taste is. If you are a smoker and you have not tried Captain Black, it’s like going to the stream and begging someone who fetched a bucket for water. The slow-burning, aromatizing tobacco tastes impressive with hardly any nicotine. Even when you smoke around someone who does not like smoking, they will be tempted to allow you to smoke for them to enjoy the aroma being released. This means you will hardly get any complaint from the non-smokers when you are smoking any flavor of Captain Black because of its pleasing smell. Captain Black and windy city make a great companion with shared consistency value. Yes, as we praise captain black for being consistent over the years in delivering amazing product and quality, windy city cigar is trusted by its customers for their consistency in providing high-quality tobacco and accessories to the smoking delight of smokers. As we often promise, we pride ourselves in supporting our customers with high-quality tobacco and accessories to ensure you get the best at all times. Our online store is a storehouse of assorted brands of smokes and related accessories that give you what you want without condition. Visit our captain black tobacco product page now or talk to our customer service about what you want and we guarantee you will be served with thanks. This entry was posted in RYO LifeStyle Blog and tagged captain black, Cigars, pipe tobacco, ryo, smoking.